Florida, subtropical member of the United States, has always been tempting us as a paradise of nature with sunny beaches and palm resorts and, like not many other countries in this world, can praise itself for being situated on the border of two warm seas. Florida offers a colourful variety of activities that will hardly be found anywhere else: coastlines of 3000 kilometers of length, an ocean breeze which makes the heat bearable, huge forests of mangroves, exciting tours on hovercrafts through swampy waters and, last not least, visits at the aboriginals, Floridas last Indians. If you enjoy diving and snorkeling you will find Florida to be your dorado with the biggest living coral reef of Northern America and its sunsets are as fabulous as otherwise only in the Caribean Sea. You may look forward to your holidays in Florida and already start relaxing when packing your suitcase as you will need not more than a pair of shorts, tennis shoes, some T-shirts and of course your bathing shorts. Don't forget a big sun cap, your sun glasses and especially sun cream with protection factor 25. You are travelling to the "Sunshine State" and the nickname really fulfills all expectations. Florida lies on the same latitude as the big deserts in this world, the Sahara or the desert Gobi for example, but in contrary to those it presents a green excessive vegetation. 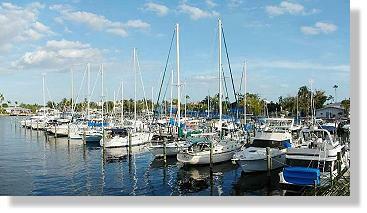 Cape Coral - "Americas Venice"
Cape Coral, situated along the warm waters of the Gulf of Mexico, really is paradise. Its climate not only is pleasant but also healthy in the true sense of the meaning. 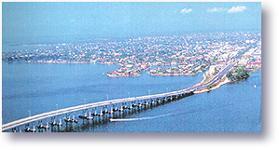 Even during the summer months you will feel comfortable due to the closeness of the Gulf. 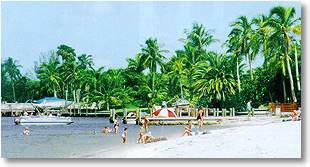 Although being one of the quickest growing cities in the USA, Cape Coral has not lost the atmosphere of a small town and its nice flair. 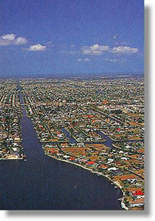 Its criminal rate is the lowest compared to other cities in Cape Coral's size which contributes enormously to the quality of living. The Gulf offers a wide variety of fresh sea food so that not only Steak fans can look forward to a delicious meal. The regional plantations surrounding Cape Coral will always guarantee baskets full of fresh fruits and those who enjoy a good glass of wine should not miss the occasion of a wine-tasting as the grapes are spoiled by the sun throughout the year.